Consider the sedge (genus Carex), that vigorous and beautiful groundcover, when thinking about plausible substitutes for lawn. 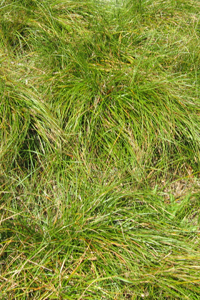 It may look like grass, but the sedge is a botanically distinct member of a completely different family. With an estimated 2000 species worldwide, the sedges can offer many different sizes, colors, and exotic textures for the adventurous landscape designer. However, here in the American West we should always be aware of garden water needs (or lack thereof), thus restricting our range of choice -- most Carex species need lots of water. But not the Pacific Dune Sedge (Carex pansa), found natively in sand dunes from central California to British Columbia. It has grown here since before the time of gardeners and water hoses; it drinks when it rains. This makes it an excellent choice for low-maintainence, drought-tolerant alternative lawns in the San Francisco Bay Area. Continue reading In Praise of Carex Pansa →. This high-tech lumber from Boulder(CO)-based Engineered Timber Resources is manufactured from 100% reclaimed and recycled Poplar wood veneer sourced as waste from the furniture and pulp industries. The reclaimed fibers are cleaned and sorted by color, then kiln-dried, layered to resemble the texture of real wood, mixed with a low-VOC resin, compressed under 1800 tons of pressure, and finally cured with slow heat. The resulting log is not only durable and hard-wearing, but also extremely stable. And its appearance can be customized based on the raw material inputs and the desired outcome; the product can be infused with organic dyes and colorants before compression, for a solid-body integral color that is therefore sandable. Songwood can be milled into any shape and used for any of the traditional interior or exterior applications of regular wood. In addition to Songwood, the company produces other modern reclaimed wood products including BURL (designed with a marbleized texture), Mulberry (compressed mulberry branches sourced as waste from the silk industry), and many varieties of compressed bamboo fiber (in colors and textures both natural and dyed to resemble exotic species). A round of applause, if you please, for ETR and other manufacturers who divert waste from the landfills to create attractive and long-lasting building materials.